Give your child a firm understanding on how the world began and how sin entered the world with this detailed lesson guide. Descriptive story outlines will help you prepare for telling these important stories, and the practical applications sprinkled throughout the narrative will help you draw important life lessons and relate them to your child’s life. Featured are stories about the 6 days of Creation, Garden of Eden, first sin, and first sibling rivalry. 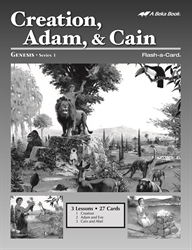 Paired with the Abeka Flash-a-cards, the story of the beginning of the world can be one of your child’s favorite Bible stories.